The card has ‘KODAK’ and ‘POST CARD’ printed on the back but nothing else. The engine is an ‘Improved Precedent’ or ‘6ft 6in Jumbo’ or ‘Big Jumbo’ but the number and name are unreadable. Just a wild guess, but possibly Winwick Junction looking south, with the train heading towards Earlestown and Liverpool, and the main line to the north on the left? Nice try, Harry, but I don‘t think so. 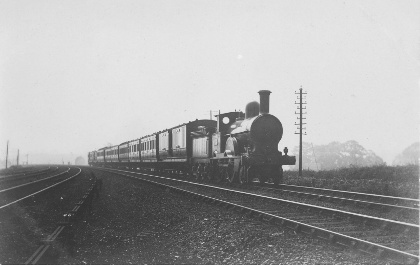 The point rodding suggests that the photo was taken from the ground by the signal box, and Winwick Junction was on the up side of he line. But only two rods — insufficient for two points and a facing point lock?? I would agree with Philip regarding the point rodding. In the foreground there are two compensating cranks side by side which suggests their termination points are equidistant. To the right of the rods there appears to be an extremely slack signal wire which might indicate a double pull distant -not common. On the far left are three poles the furthest looks like a starting signal in the off position, but, it does not look to be associated with the running lines. Other than that I have nothing more to offer. My wild guess (maps on order) Leighton Buzzard & Linsdale area? Coal rails on tender, so post-c1895, apparently square socket lamp brackets, so pre-c1905.